Is this hand painted or printed on canvas? We as art factory with thousands of decorative oil paintings including modern art, contemporary art, abstract acrylic painting, famous art, pop art and so on, to satisfy all of your fine art needs. Hand painted abstract acrylic painting on canvas. 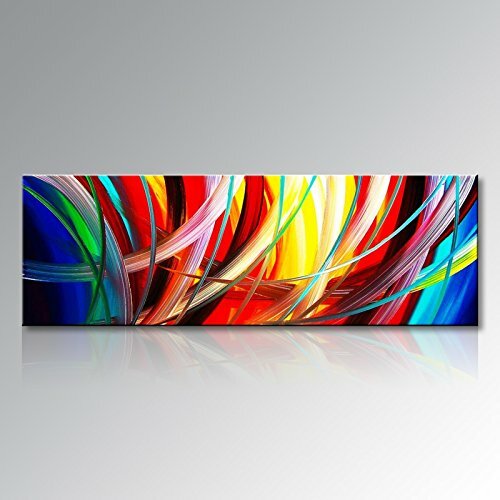 This handmade canvas wall art for living room, bedroom, kitchen, office, Hotel, dining room, bathroom, bar etc. Stretched and Framed decorative canvas oil paintings set ready to hang for home decorations wall decor, edges are painted,each panel has a black hook already mounted on the wooden bar for easy hanging.